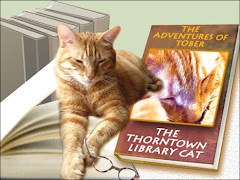 The Adventures of Tober, the Thorntown Library Cat: Intruder Alert! Intruder Alert! Yesterday we had a terrifying Summer Reading Finale program here at the Library! I knew that Coyote Chris from Silly Safaris was going to be here, and I knew that there would be an International Food Tasting after the show, but I was NOT told about all the weird and vicious creatures that would be inside my library! The program was Animals with "Tales" from around the World. Here are the animals he brought in order of horribleness (least to most), as determined by me: a tree frog, a turtle named Shelby, a fuzzy rabbit, a skunk (it was destinktified), a coatimundi, a Madagascar hissing Cockroach (the horrors! ), a snake as thick as a well-fed cat belly, a baby (or at least SMALL) alligator, and a potentially cat-eating Owl of Doom. The children (and grown-ups!) really enjoyed the program. Coyote Chris told all sorts of stories and interesting facts about each of the creatures, and the children even got to pet some of the less-horrible ones. I think the children were very Brave to be in a room with some of those animals. After the program, and after all of the people washed their hands, we had the International Food Tasting. The Staff was very eager to help with the eating serving of all of the different foods. (From this picture you cannot tell it. For some reason, the staff hides from camera-pictures. If we ever need to evacuate the building, we'll send AAB Photographer around to point the camera at people.) Some Mommies and Volunteers helped as well. Visitors got to try Coconut Macaroons, ANZAC Biscuits, Sweet Scones, homemade Ginger Ale, Mealie Meal Bread, Pasta Guayabe con Queso, Tacos, Puerto Rican Rice with Chicken, Sweet Potato Fries, Chinese Fried Rice, Asian Snack Mix, Thai Candle Cookies, and Hummus. Much of the food was declared Quite Yummy by the tasters, although the smaller tasters had no qualms emitting "yucks" and "ewwws" when they found things not to their liking. No one brought me anything to eat, and I was exhausted from all the working. Maybe the owl sensed that I was a tired, weak, underfed kitty and decided that it should settle for whatever Coyote Chris feeds it, instead? Hmmmm. I am happy to report that the unauthorized (by me) animals left promptly after the program, and I am now the only non-human living in the Library. Which is how it should be. Mmmm. Chick-hen?? And mama loves sweet potato fries and says they are even healthy! The feather thing does look scary, though. That was a close one, Tober! 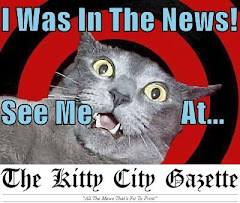 OMC !!!! Tober, Those intruders are so scary !!! Especially, Alligator, snake and Cat-eating Owl. What's an exciting day ! We are aghast that no Cat Treats were served! The alligator scares us the most. I am shocked that somehow these animals got into your library. Don't you have any "say" about what comes in and when? Screaming, spitting cockroaches? How gruesome! I hope you never have to go through another one of these! 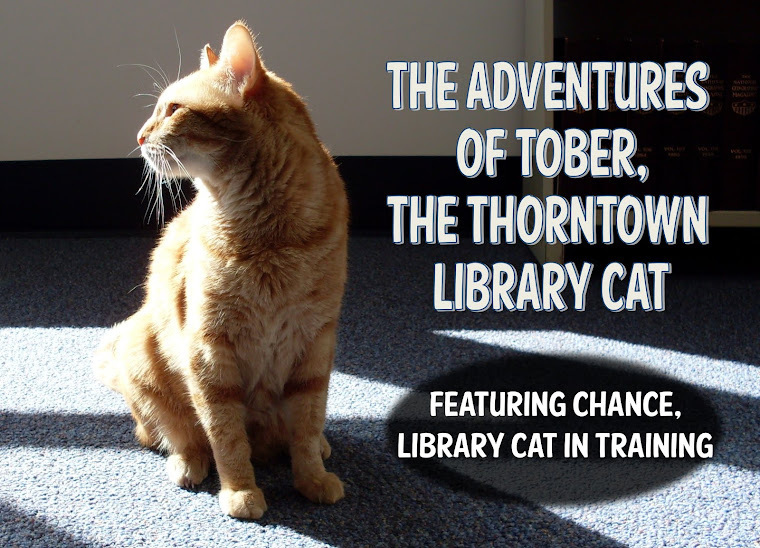 Tober, after suffering through these horrible creatures invading your library, I think the least your assistants could have done was let you have the hissing cockroach as a toy/ snack. Wow! What a day for u Tober. That owl was a mighty intimidating creature! What a lovely tasty selection of foods. Hope you got to try some! HOW DARE THEM NOT BRING YOU ANYTHING TO EAT!!! ESPECIALLY AFTER THEY LET INVADERS IN!! We hope you fired them! I dunno about these guests you go there. That flappy wing thing isn't my favorite. And no snacks for you, even worse! 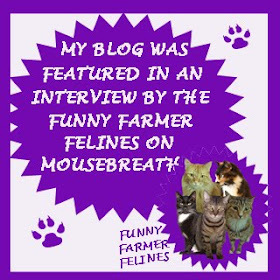 Hey Tober, check out my new skill I learned from you: Catloafing!